Inspiration is drawn from the oddest places. This week it comes for me from an episode of the television show Black-ish. If you haven’t seen the show, Black-ish is about an upper-middle-class black family led by a mother and father named Dre and Rainbow, living in Los Angeles. Kinda like the Cosby show but with crisper writing and a social conscience. If you are a white person, watching Black-ish will probably make you a little uncomfortable at times, but you’ll also probably learn a few things. The family was upset but eventually accepted Dre’s arguments – supporting Black artists, the importance of history, the debt owed to your predecessors, cultural pride. They reluctantly agreed to watch the movie. Unfortunately, it quickly became apparent that the movie was terrible. Slowly the conversation began to evolve into at what point does the family abandon their cultural obligations and go see the other film. Obviously, the show is a sitcom, and thus the scenes are played for laughs, but the underlining theme is not dissimilar to what is playing out right now in Nashville when it comes to the leader of its school system. On one level, we are having this very ugly public conversation about race. One that I predicted we were headed to towards 2 years ago. But after talking to a number of people across the city who are White, Black, and Hispanic, I’ve come to the realization that there is a whole another underlying conversation taking place in communities, churches, and homes across the district. We tout things as being “historical” or “groundbreaking” but then we act as if the mere appointing, or beginning, is the end of the process. Nashville has never had a Black superintendent before, or for that matter a black mayor. Which means a Black superintendent has never faced criticism from Nashville citizens before. Since this is all new territory, is it really a stretch to realize that as a city we are pretty bad at it? I suspect that once a woman is hired as superintendent, we’ll go through a similar process again. Meanwhile, citizens are trying to figure out just how much of their criticisms are racist and how many are solidly based on performance? What is the proper way to voice criticism? What is the proper way to defend? What role does Nashville’s history play in the discussion? At what point, like the Johnson family, do you accept that the movie is poor and move on? Recently a report on R.Kelley aired that made people start asking hard questions about what members of the black community refer to as “black protectionism”. I am in no way comparing Dr. Joseph to R.Kelley, but I am saying that protecting someone solely to benefit the community is not without cost. The opportunity gap is growing at MNPS. Jere Baxter, a priority school that serves primarily African American kids reportedly doesn’t even have a full time librarian. How is that possible? Several East Nashville schools don’t have an AART and haven’t since the beginning of the year. Why are we rallying for a man instead of the children at those schools? I don’t have the answer, nor would I assume it should come from me, but the mere fact that I hear these conversations taking place is cause for optimism. The conversation on the main stage suffers from inflated egos’ and posturing. Much of it comes down to promoting personal ambitions. Unlike the public conversation, the private conversations are held with an intent to heal and find clarity. Ultimately, private conversations will influence the public one, and that will be a better day for all of us. The irony that all of this is playing out as we approach another celebration of Martin Luther King Day is not lost on me. If you’ve never been to the annual march on Jefferson Street, or even if you have, I urge you to go this year. Things get started around 10AM. But even if you don’t attend please take a moment to reflect on Dr. Kings message and his commitment to unity. I understand that it, not the place of an old white guy to dictate how a civil rights icon’s holiday is celebrated. But that doesn’t mean that I can’t have prayers. And my prayers are that the day is used in the pursuit of healing and not as a means to further divide us. Those of you who follow Dad Gone Wild on Twitter were not surprised by the announcement of Penny Schwinn as the new Tennessee State Education commissioner. By now you are more than likely well aware of the baggage her appointment brings to town. I don’t want to get too deep into her lack of qualifications, Momma Bears does a better job then I could, but I do want to make some observations that you may not be privy to. This appointment has the fingerprints of failed TNDOE head Kevin Huffman all over it. Schwinn and he have Teach For America, Chief’s of Change, and the Broad Academy in common. I’ve heard rumors over the last several months that Bill Lee had been getting advice from Huffman and this selection seems to bear that out. To what level I don’t know, but like lead in drinking water, there is no safe level when it comes to educational advice from Kevin Huffman. In scouring Schwinn’s past I see no overt support for vouchers nor Educational Saving Accounts(ESA). I’m told that any candidate that didn’t indicate support for vouchers or ESA’s was eliminated from consideration, but here is something to consider. Schwinn is known for her focus on priority schools and is an advocate for a state role in turnaround strategies. It’s kind of hard to take schools over and then give everyone a coupon to go elsewhere. Time will tell. Schwinn is described as very personable and reportedly is known for her ability to handle criticism with grace. Her supporters have indicated that she actually seems to thrive under attack. That is a skill she’ll need to rely on during her tenure in Tennessee. When it comes to education policy…we don’t play. So what does this all mean for MNPS? A perusal of Schwinn’s resume shows that in 2014/2015 she was the Chief Accountability Officer for the Delaware Department of Education. That indicates that her and MNPS Director of Schools Shawn Joseph most likely have crossed paths. The natural assumption would be that the two have a positive relationship. Keep in mind though that Joseph left his position as head of the Seaford School District mid-year after a tax referendum failed. That failure left the new director the very challenging job of fixing the upcoming school budget as it had been written with the assumption that the referendum would pass. Which may mean that the relationship between Joseph and Schwinn ain’t so tight. As always, all of this will play out how it’s going to play out. As long as our definitions of success are congruent, I wish her success. When they are not congruent, I’ll be lining up with other like-minded citizens to oppose. The more things change, the more they stay the same. Social media gadfly, and part-time MNPS Board member, Will Pinkston hit the center stage again this week. At the beginning of the week he look to the 16th District’s Facebook page to tout his new plan to utilize property across from the new soccer stadium for workforce housing for teachers. When some citizens voiced concerns or even asked questions, Pinkston quickly became contentious. In no time at all the dialog spiraled out of control with him labeling those who disagreed as “cranks” and threatening to take his property and go home. As the discourse lasted late into the evening and grew more vitriolic, I began to realize that there was more involved here than just thin skin. As a result, I took up Pinkston’s offer and emailed him. 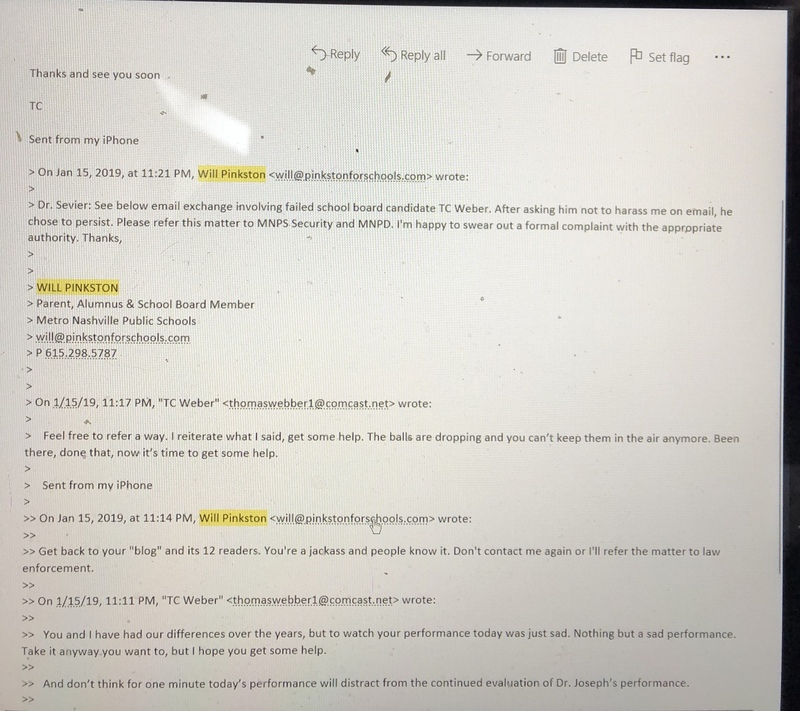 An action he did not take kindly to and resulted in him emailing board liaison David Sevier at 11:30pm asking him to inform MNPS security and MNPD that he was being harassed. Pinkston’s boorish behavior has long been tolerated out of respect for his intellect, and work on behalf of working-class people. That recognition has arguably jumped the shark. In the present climate, and with the many pressing needs of MNPS, it’s time to rescind that acceptance and recognize that he’s actively contributing to the dysfunction of the board. Once again it is the middle of January and the formative assessment that should be well underway is mired in bureaucracy. Pinkston chairs the committee charged with overseeing the development of the superintendent evaluation. Will it be done, by the end of the month and to what end? Seeing as there has been only one evaluation in 2 years, prospects aren’t promising. Pinkston attends board meetings at whim, and when in attendance seldom stays until the director’s report. I’m curious how one chairs the evaluation of someone who’s presentations they don’t attend. When you take into account that the property that he is proposing be used for workforce housing is located in an area undergoing a multi-million dollar renovation, it seems that once again Pinkston is attempting to create a distraction. But to what end? He often touts his close relationship with Mayor Briley but his behavior can’t be helpful to Briley getting re-elected. His own career as an elected official is likely coming to an end come next summer, so what he hopes to accomplish is undecipherable. Haven’t we been over this enough? The EPA sets an action level at 15 ppb. That does not translate to everything under 15 being safe. Anything above 15 ppb is most certainly not safe. Currently, MNPS is using 5 and 10 ppb as desirable levels. So since we already are adhering to tighter standards, why would we want to give some wiggle room. Board members have countered that this is a policy recommended by TSBA. It’s my surmise that TSBA set the looser limits because there are rural school districts with lots of aging buildings and no cash. Putting too tight of constraints on those districts might lead to them adopting no new policy. Better to get them started on a weaker policy than none. 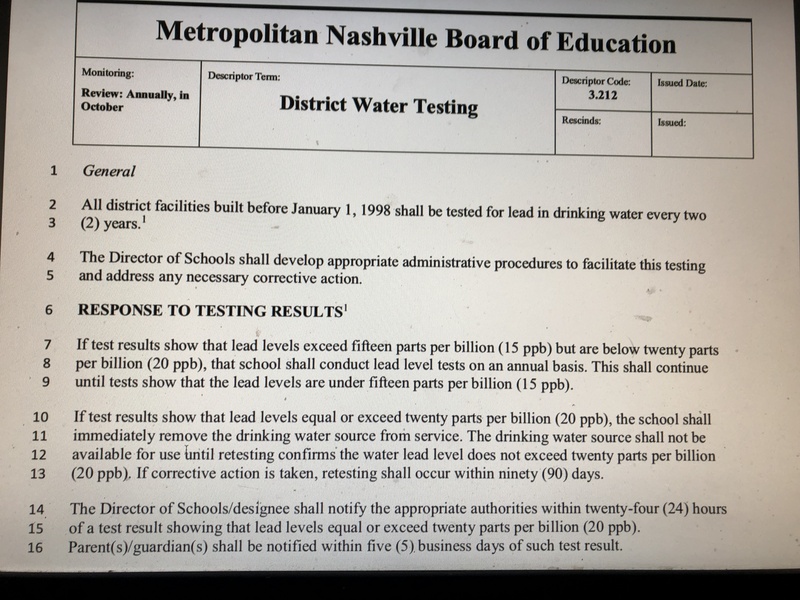 Still, MNPS has already adopted stronger standards so I see no reason why the standards and the policy shouldn’t align. If they don’t, what is to keep the district from slipping back to weaker standards at some time in the future when the spotlight is turned off? It seems like nobody at Bransford Avenue is happy unless there is a whole bunch of disruption going on. 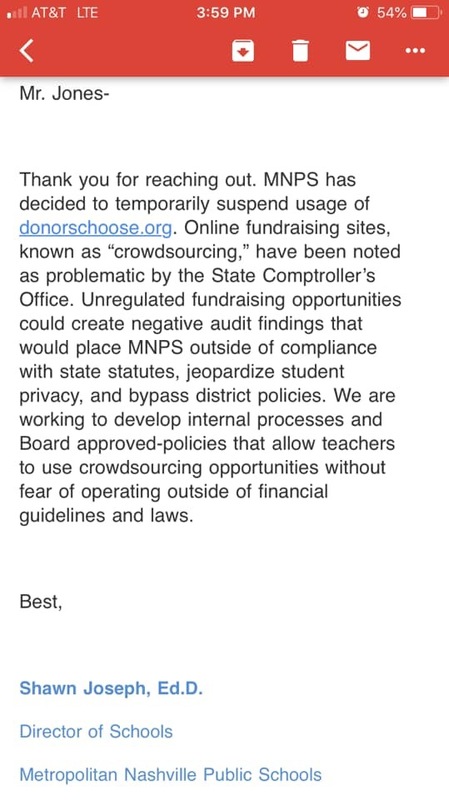 Coming hot on the heels of that proposed workforce housing for teachers, last night Channel 4 News reported that last month the district had suspended use of the popular site DonorsChoose. 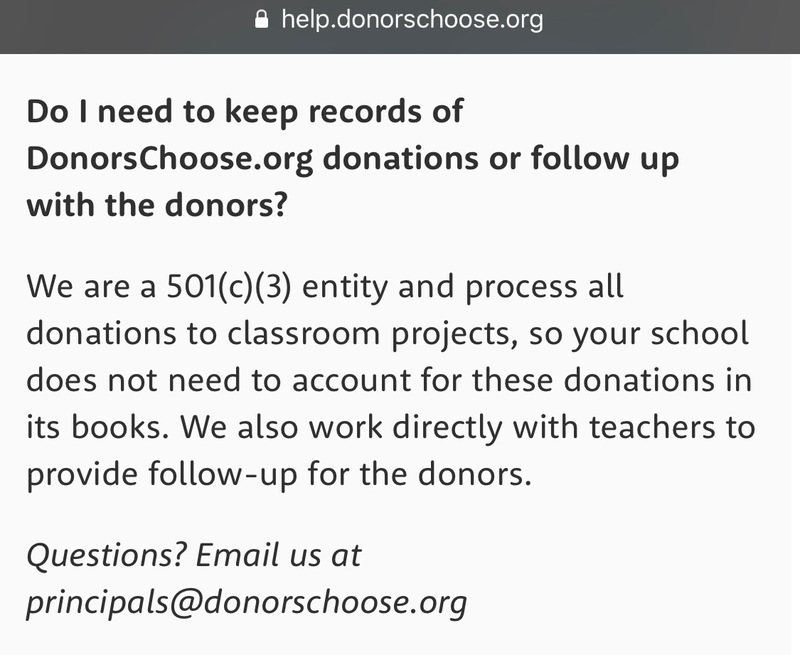 DonorsChoose is a national 501(c)(3) that helps teachers secure resources for their classrooms by providing a platform for donors to fund individual projects. As of August 3, more than 72,000 projects were posted on DonorsChoose.org, where teachers raise money for everything from books to clothing for students. That’s up from 39,391 on the same date in 2016 and 23,599 in 2015. Last month the district notified teachers in an email loaded with some legalese that most teacher’s translated into, “We can’t have you out raising money for your classroom because we don’t trust that you’ll actually use it for your classroom.” You can dress it up better, but that’s the basic message. Teachers are like the crowd cheering on gladiators in the ring. Clamoring for blood in the form of suspensions for innocent kids. Incapable of delivering rigorous instruction without the implementation of scripted lesson plans. Expected to sacrifice personal time to do unpaid work for their classes, but not trustworthy of independently raising money to fund innovative plans. The district claims that the directive came at the request of the state comptroller’s office and it may very well have. However once again, the district did not feel the need to adequately explain a policy change to those most impacted by the change. As a result, one more disruption in a world where disruption has become the rule and not the exception. I briefly attended today’s school board retreat, despite my apprehension over my impending arrest. While there I listened to a debate about the board hiring a mediator. Both newly elected board members Gini Pupo-Walker and Rachael Elrod were adamant in their belief that one is needed to reunite the board. The proposed action comes with some cost though, board chair Sharon Gentry stated that it would cost 250 dollars an hour with a minimum requirement of 9 hours per board member if the board utilized the Tennessee School Board Association. That information runs counter to numbers put forward by fellow board member Amy Frogge. My surreal moment came when the gentleman currently facilitating the meeting suggested that his company could offer the service as well and would supply Tommy Chang the former Boston Superintendent who was recently forced to resign, to conduct the mediation. A simple Google search shows that Chang resigned amid growing concerns from Boston Mayor Martin J. Walsh about his struggle to deliver significant improvements to the city’s school system. Furthermore, he was accused by student groups of failing to disclose whether the school system handed over student information to federal immigration authorities. Eventually, Boston Mayor Martin Walsh declared,’“we need a long-term education leader with a proven record in management who can gain the confidence of the community on the strategic vision for the district.’’ Does that really sound like who we need mediating our school board? To the board’s credit they never seriously considered Chang and instead have opted to pursue TSBA’s assistance. However, I would question the choice of who’s leading the retreats. Considering that we are paying FourPoint Education Partners upwards of 64K for their advisement, they should be a little more sensitive to the current culture and realize the inappropriateness of utilizing Chang. Three board members were not in attendance at today’s retreat due to trust issues that spring from dealings with controversial individuals like Chang. In light of recent revelations, every effort should be made to steer away from people tainted by excessive controversy. Either the whole education world is a little bit shady, or we seem to attract the wrong players. Either way, the mere recommendation makes me wonder about other recommendations that FourPoints has offered. Personally, I’m not sold on the value of mediation. Board members are elected to serve the needs of their constituents and at present, while everybody is unhappy with board behavior, I don’t see evidence that they are overwhelmingly unhappy with their board member’s behavior. An important distinction. Board member A altering their behavior may make board member B happier, but is it going to make either’s constituents happier? Are we going to spend money on mediation when we are just 18 months away from an election that may see as many as 5 seats change hands? In that light, I’m not sure that the bang is going to be equal to the buck and if mediation is already necessary a mere 4 months after 3 new members were elected, something else might be amiss. If you consider that based on required paperwork and other obligations it would probably be summer until any actual sessions took place, maybe we just need to let people get their act together and find their own way forward. No offense to the new members, but I’ve never worked anywhere that the newest members got to demand action to improve outcomes before they spent significant time at the job. Just saying. Another week, another student loses their life to gun violence. It’s got to stop. Just offering prayers to Jose Gutierrez’s family and friends is not enough. Isaac Litton is hosting the NE Quadrants next Conversation Café with Dr. Cathey on Wednesday, January 24, 2019 at 5:30. Everyone is welcome and teachers in the NE Quadrant to attend. Thanks to donations from various groups, Harris-Hillman has received new equipment for the school’s therapy rooms. The new equipment includes such items such as an indoor therapy slide, new large indoor swing and other types of specialized equipment. Two Harris Hillman teachers presented at the TN Association for Assistive Technology statewide conference and shared some of the effective practices that the school has developed for students. Congratulations to Rosebank, Harpeth Valley, Shwab, Lockeland and Chadwell Elementary School for state-level recognition! These schools were selected by The Tennessee Department of Education and the Tennessee Behavior Supports Project (TBSP) as either Schools of Recognition or Model of Demonstration Schools for their implementation of Response to Instruction and Intervention for Behavior (RTI2-B). These awards are given in recognition of the RTI-B (or MTSS) team’s hard work and dedication in improving learning and positive behavior within their school. The purpose of this identification is to enable schools to share their practices, examples, and celebrate each school’s effort and dedication to meeting the needs of all students. MNPS will host a vendor fair for academic interventions at the Martin Center on February 5th and 6th (8:00 – 3:30 both days). The fair will include Tier II, Tier III, and Special Education literacy and math interventions that were identified through an RFP process and are approved for purchase for the 2019-20 school year. There was a listening session in Antioch in November. I think it is time to ask Fran Bush what became of the charts collected at that session, and get an update on where the district is on addressing the issues that were shared. That is the thing MNPS fails to do, circle back to what was done to address teacher concerns when they are shared in the allowable way. Otherwise it is just an exercise in teacher just getting it off their chest, not problem solving. Those teachers didn’t just bring complaints, they brought solutions. So what happened? What should teachers do with a policy they do not agree with that is sent to all staff? We can’t take it to the board, or social media, or the news. So the message is, shut up and take it, or leave. I wonder what would happen if you invited teachers to start a public list of all the things they fund themselves or with donor dollars and it’s direct impact on their evaluations. All the things that engage students and delight parents. I guarantee the most memorable parts of your child’s classroom are not funded publicly. I’ll start with my students favorite parts of my room. Technology- Raz-kids, TPT, iPads, etc. Donors choose funds the creativity of teachers. That seems to be the problem. None of the above happen with a scripted lesson, or come in a boxed curriculum, yet I can cite research evidence for all of it. It is the same nonsense with the BEP monies teachers get. I got books at a conference and the vendor gave me a receipt, but it didn’t have the titles listed. I was told I couldn’t use it for reimbursement, which was fine because each year I spend more than the district gives me and my tax break by 10x. Much of this supports SEL, the district isn’t giving all K-2 teachers monies for sensory spots or items to make your classroom less clinical. Yet of you have one of those kiddos that they don’t want to suspend, you better believe your going to need much of it to manage your class. It is policy without any plan for implementation. This is exactly what it looks like: do this, but on your own time, and now, with your own money. It’s a problem. Teachers are teaching the same book the same week yet sharing some times one book per 3 or more classrooms. It might not sound like a big deal, but it is one more thing to manage, in days packed full of more important things to manage. Being well planned and well organized isn’t possible for a week if you are passing around a book. So these teacher buy their own to mitigate stress. They chose, sure, but did the district help them be successful? Those management techniques that elementary teachers use,(sing bowls, chimes, bells sensory baskets, flexible seating) those aren’t supplied, but often suggested to first year teachers after a evaluation post conference. Here’s a policy that would help teachers, if it suggested in a PD or post conference the district should supply the materials needed to implement in your classroom. After all you shouldn’t hold me accountable to practices that require materials you aren’t going to pay for. It’s interesting that at yesterday’s retreat under director evaluation it was discussed removing standards that were on his evaluation that were impacted by lack of funding, you make a solid argument for doing the same with teachers. Making cuts to teachers while Dr J uses funding to pay consultants (even if we already have more expertise in the district), his driver, bought new vehicles, gave hefty raises to the friends he brought in (Sito Narcisse & his wife cost the district almost $500,000 a year after you count benefits), added more jobs to central office, remodeled central office, traveling all over the country while teachers aren’t allowed to travel, law suits…..the waste of money goes on & on…..
Tennessee Against Common Core was the first to do research and distribute information on the new Commissioner of Education, Penny Schwinn. I have good contacts in Texas and got the facts first hand about her. Look forward to a big push to convert our traditional public schools into Charters. Her husband, Paul, is the VP of IDEA Charters. Broad Academy is all about running schools like a business and their philosophy fits perfectly with Charters. When you run schools like a business the bottom line, not education, become the top priority. Broadies are also taught to use chaos as a tactic so anyone that possesses skills at confrontation has succeeded at the Broad model. Apparently Schwinn graduated that part of the course with honors. Her past record speaks for itself. Knoxville education system is very cozy with TFA and Broad Academy graduates. I did not vote for Bill Lee because I knew his campaign rhetoric was just that, rhetoric. You don’t have to have held elected office to be a politician and Bill Lee was and is a politician. I voted Independent because none of the R or D candidates had much going for them. I voted for a statesman not a politician. So go ahead voters of Tennessee keep voting for the better of the evils. In the end evil is evil. We got screwed again and YES, Dad Gone Wild, I do believe Huffman has his fingerprints on this decision which makes Bill Lee even worse that I thought. I said from the start, after being attacked for not supporting Lee, that I would be the first to apologize if I was wrong about him, but I also said I would be the first to say “I told ya so.” I TOLD YA SO!! Donors Choose sends you the items you receive funding for, not money. They are very careful to prevent misuse of funds. I’ve used Donors Choose twice in past years, and they even check with your principal before posting your project. When it is fully funded, they check again to make sure that you are still at the school and still need the items. This is another “paper-cut” for teachers. I think you need to keep your eyes and ears open for the name Lillian Lowery. She is the main Broad-y in this scenario. She may have even been a candidate for the State Super position and no one ever would know due to lack of transparency. She seems to move around every 2-3 years and I would guess that her time is up in Ohio. Did Lowery get the Ohio job over Schwinn? Schwinn was among the contenders in Ohio but dropped out in order to take a job in Delaware. Perhaps she backed out of Ohio for TX….hard to keep track. She has been a moving target. He is the VP of IDEA Charters…they call it IdEA Public Schools. They are all.about replacing traditional public schools with Charters turning education into a business which is what Broadies are trained to do. Paul also was a Leadership Coach in Philadelphia for The New Teacher Project. He is also a TFA Alumni. So this couple is all.out to get rid of the current certified teacher and replace our schools with Charters……that is the TNTP, TFA, Broad agenda. I don’t know. We were glad to be rid of Lowry. My sister was a teacher in DE and she was happy that Lowry was gone (although she pitied MD). It was all aligned when she came to MD and then Joseph, Dance and Foose were all hired by different counties as Supes. Howard Co, MD was not happy with the vetting process of Foose as the whole thing was done without open discussion. It is fortunate that our state teacher’s union is strong. No one really knows why Lowry left because she accepted a contract for another term and then a few months later she announced that she was leaving……no clue if the state had to pay her even though SHE broke the contract? We know the outcome of Dance and Foose but you are stuck with Joseph for now (I pity you!). Oh…and I too, love Black-ish. Watch the next one on “colorism”/”shadism” . It will really make you feel uncomfortable but it is so true. I love the eye rolling Ruby when Obama and Kanye (slavery was a choice…OMG!) are mentioned. “Get on the Bus” is about the million man march, not Rosa Parks. Don’t get your hopes up on “optimism” converting to action any time soon. In this perception-is-reality world that we live in, there are two things that are just not changing: the Joseph contract will be reupped no matter what, and the council isn’t ready to fund a big increase in funds. That’s because there are broad enough perceptions to make inaction on both counts quite easy for the elected officials involve. Those perceptions are very difficult to change, even in the face of investigations. There might be a slim chance for broad changes in the conversations in August 2020 depending on how districts 3 and 7 swing. That’s a pretty long way away to be talking “optimism” for action. 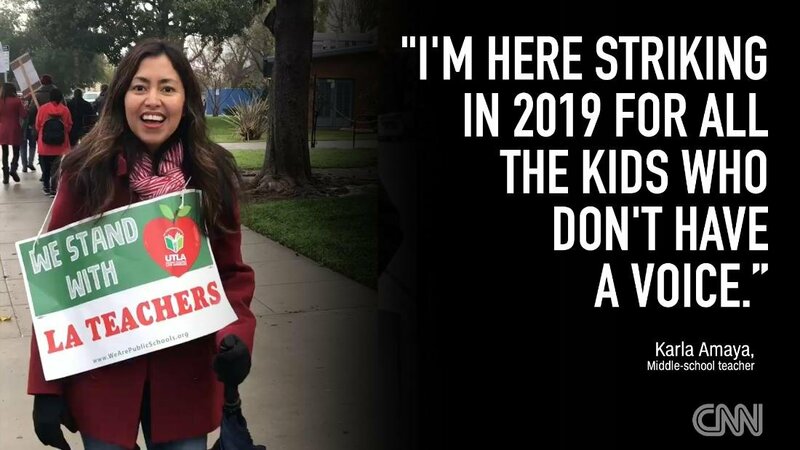 And teachers will be very very lucky to walk away with a 2% raise and even that might be a stretch. It could easily water down lower than that. They’re scrapping for every dollar. East Middle/High will probably go to one principal, for instance. Nice savings, yes. Just want to point out that it represents approx 0.01% of the budget. You’d need to scrap at least 15 or more such positions to fund raises. That’s where we’re at, scraping into bone to try to make this work. As a PS… I am “optimistic” we will get good conversations from the Mayor’s new panel on priority schools. History says this will be full of “optimistic” hot air, but it would be nice to be proven wrong. I am also “optimistic” the new state DoE head means business on fixing state tests. She does have a history of reducing testing times, right? this nightmare scenario is why I am leaving the district as soon as a good offer comes along. I want off this crazy train.